Soak rice and dal for one hour. Make a smooth paste of the above ingredients. Take oil in the cooker.Add all the seasonings.When they splatter add all the vegetables. Saute for 4-5 minutes.Then add the grounded masala and cook for another 3-4 minutes. Then add tamarind paste and salt as per taste. After 4-5 minutes add soaked rice and dal. Mix throughly and add water. Serve with raitha and chips. I love this dish !!!!!!! BBB with chips,my fav..looks prefect for me..
Wow! 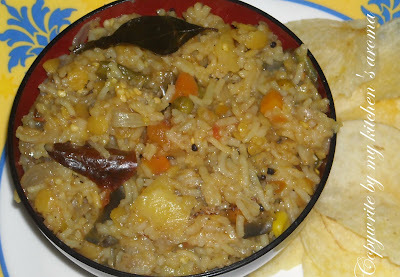 Bisi Bele Baath is my favorite! I can almost sense the taste in it! Looks yum.. one of my favt! love this..this is my brunch during weekends at my place.. I love this simple and yummy dish!